'The court has spoken,' says Presidential Spokesperson Harry Roque after a Makati court ordered the arrest of Antonio Trillanes IV. 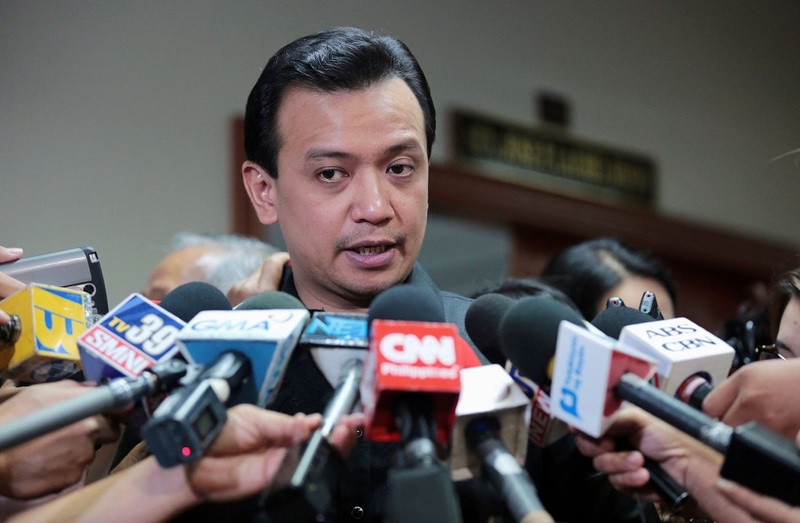 Malacañang on Tuesday, September 25, said it respected the decision of a Makati court to issue a warrant of arrest against Senator Antonio Trillanes IV for a charge of rebellion. "The court has spoken. As the President has said, we will respect the decision of the judiciary. Whatever Senator Antonio Trillanes IV has to say can be addressed to the court," said Presidential Spokesperson Harry Roque in a statement Tuesday afternoon. Roque also alluded to Trillanes' frequent press conferences or press cons at the Senate as he was facing the threat of arrest. "Let us stop the drama by press con and allow the legal process to take its course," Roque said. In a separate interview on ANC, Roque said, "Since the President deferred to the regional trial court of Makati, and an order has already been issued for his arrest, we are hoping that Senator Trillanes will equally respect our court and voluntarily surrender to the court so that he may prove his innocence." Roque made this statement after Makati Regional Trial Court Branch 150 issued an arrest warrant against Trillanes on Tuesday. Trillanes can post bail of P200,000. Police were on their way to arrest Trillanes when Roque issued his statement. Trillanes posted bail after he was arrested on Tuesday. Afterwards, he held another press conference at the Senate. Roque hit Trillanes again after his Senate press conference. "Senator Antonio Trillanes IV has once again played the victim card, resorting to ad hominem attacks against the President," Roque said in a statement past 7 pm on Tuesday. "We ask the lawmaker, instead of facing the cameras, to focus his time and energy in preparing his legal defense. He should view this as a welcome opportunity to submit his evidence that will prove that the grant of amnesty to him was valid," Duterte's spokesperson added.